GOLD PRICES rose 0.8% in Asian and London morning trade Thursday, reaching a 1-week high of $1295 per ounce as Kiev, Washington and Western news agencies said Russian troops were fighting with pro-separatists in eastern Ukraine. Calling for an emergency meeting of the European Union states, Ukrainian president Poroshenko withdrew earlier comments that this marked a Russian "invasion". Moscow denied its troops had crossed the border. Separatists took the town of Novoazovsk, near the Black Sea port of Mariupol. Silver moved higher with gold prices, but squeezed their 1.8% gain into just 90 minutes after the start of London trade, hitting a 2-week high at $19.88 per ounce. Eurozone stock markets fell, with Germany's DAX losing 1.4%. Government bond prices rose across the board, pushing Eurozone yields down to new record lows after Germany reported 0% consumer-price inflation for August from July. 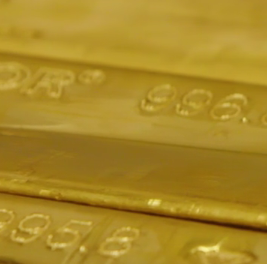 The giant SPDR Gold Trust (NYSEArca:GLD) ended Wednesday with its bullion backing unchanged at 795 tonnes, some 1% below the level of 1st March, when the Moscow parliament first approved President Putin's request to use force if necessary to "protect Russia's interests." With gold price fundamentals neutral, says French bank and London market-maker Societe Generale, bearish factors led by improved US data weigh against bullishness from the Sunni insurgency and US air strikes in Iraq, and "ongoing Ukraine/Russia tensions." "Our fundamental view has not changed," adds a note from Canada's TD Securities, remaining bearish but raising the bank's end-2014 forecast for gold prices to $1265 per ounce "to reflect recent positive price action caused by Middle East and Russia tensions" as well as "mixed" US data. The Dollar today failed to beat this week's new 2014 highs against the Euro, despite a sharp upgrade to Q2 GDP growth, revised up from 3.9% to 4.2% annualized. Q2 price inflation was revised up from 2.0% annually to 2.2%, the fastest pace since end-2012. Last week saw a drop in new US jobless claims, separate data but continuing claims for unemployment benefits came in above analysts' consensus forecasts. 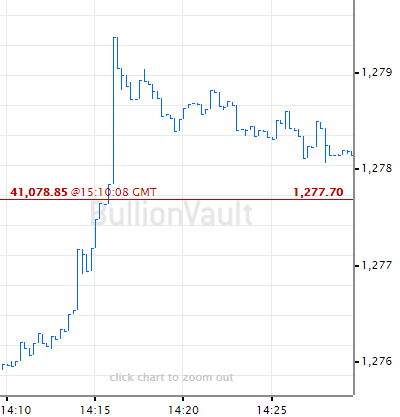 "Although plagued with a sense of under-performance," says one Asian trading desk, the gold price "continues to do the minimum necessary" to stay above what it calls the "key" level of $1275. 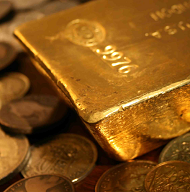 With the US Labor holiday on Monday, said Swiss refining and finance group MKS in a note earlier Thursday, gold price "ranges are likely to remain narrow and interest sparse."